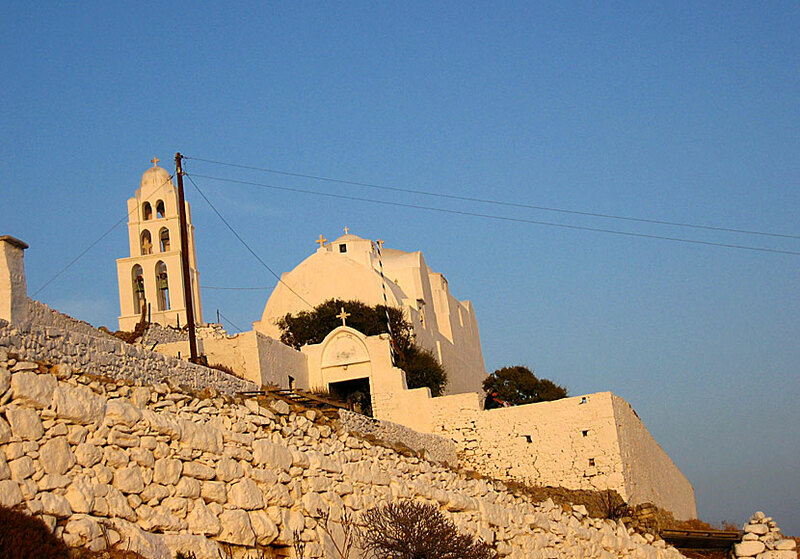 Church of Panagia in Folegandros. On the cliff above Chora the eye-catching Church of Panagia watch over the village. The church is the most interesting attraction on Folegandros, even if you normally are not interested in churches and monasteries. The church itself is worth seeing - both the interior and the exterior are beautiful. The sunset from here is amazing! Church of Panagia above Chora. In the courtyard outside the church are several ancient statues built into the walls. On the way up to the church you pass a cemetery where there is a stone wall from 5th century BC. On a mausoleum a bust of a Roman youth show off. Strange that no one steals these treasures, they should be stored in museums. The Church of Panagia is beautifully lit in the evening. Above the church of Panagia, a path leads up to Paleokastro. Paleo means "old" and Kastro means castle. 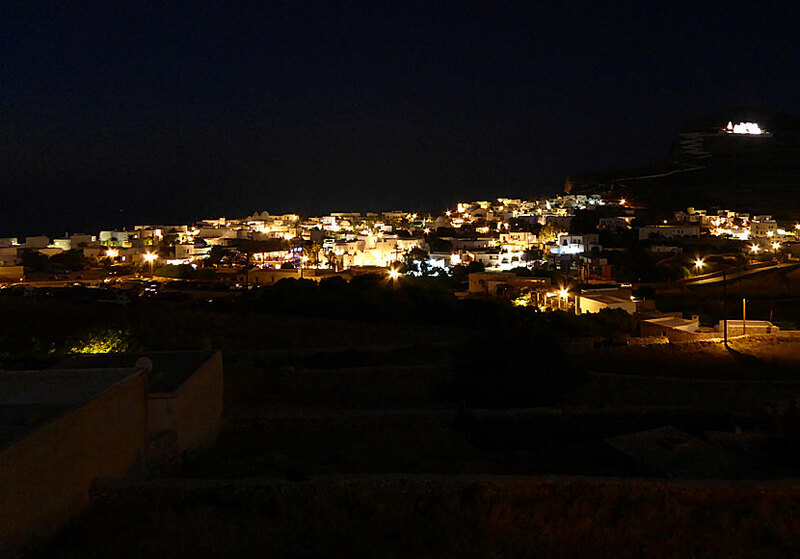 In other words Paleokastro is the old castle of Folegandros. Not much is left of Paleokastro, mostly ruins of dwelling houses. Some archaeological excavations have not been made, they do not even know how old Paleokastro is. Instead of fascinating archaeological excavations one may enjoy the views. Here you can see the stairs leading up to the Church from Chora. The church has a famous icon that was missing for many years. 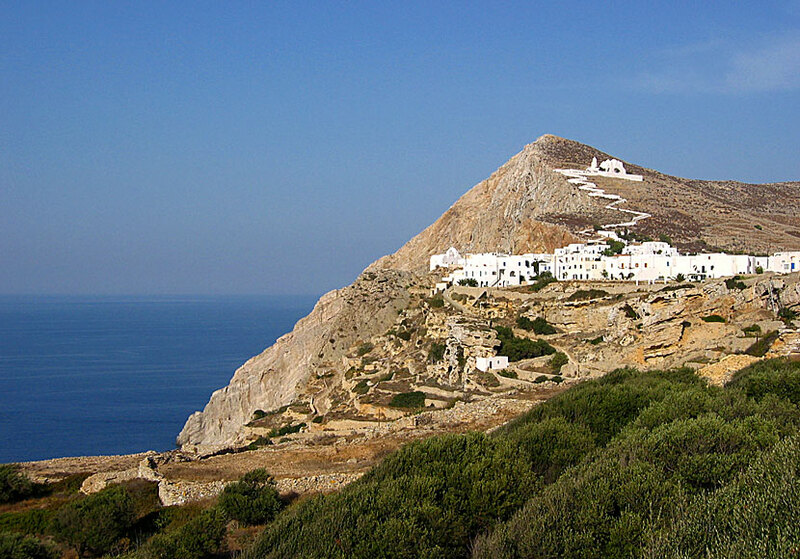 The Turks stole it when they invaded Folegandros 1715, but miraculously the icon later returned to Folegandros. Completely unharmed. Isn't it amazing. :-) A real miracle is the sunset as seen from the church.